thing better than reading it is contributing to it. You can do BOTH! 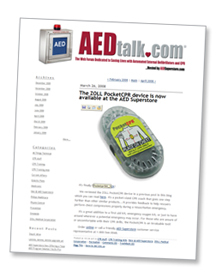 Read news and opinions that are all about AEDs and more, or comment on the posts you see in it. Do you have an idea for an entry or something you'd like to see us address on our blog? Write to us and let us know. Otherwise, click here to view our blog called AED Talk!